Saudi Aramco raised $12 billion from its debut international bond issue, completing one of the most oversubscribed deals of all time with orders of over $100 billion. The overwhelming investor demand allowed the oil giant to pay less for its debt than the Saudi government, a rare development for a state-owned entity, and underscored not only the financial strength of the world’s most profitable company but also the global chase for yield that has investors disregarding long-held conventions. Saudi Aramco’s transaction marked a comeback for Saudi Arabia after the kingdom was shunned by Wall Street and international investors last year following the assassination of journalist Jamal Khashoggi. Without doubt the rush to buy the state-run oil company’s debt will also help to lower borrowing costs for its sovereign. 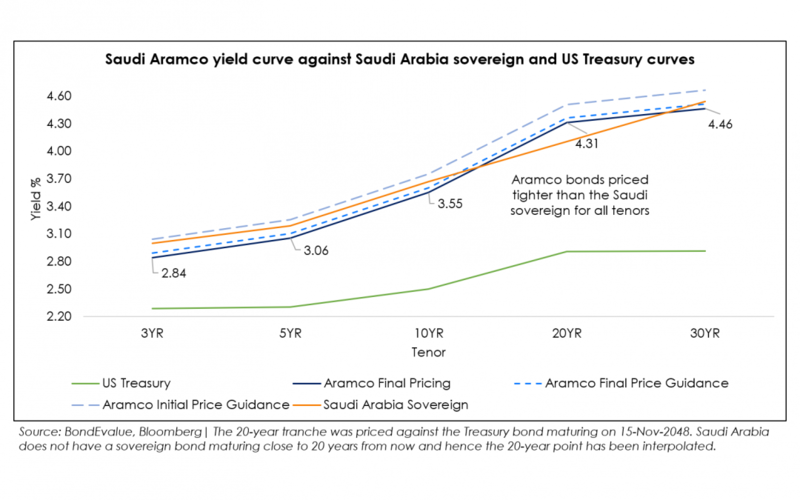 Saudi Aramco’s bond deal was split into 5 tranches of maturities ranging from 3 to 30 years, where the longest maturity, a 30-year bond, will yield 155 bps over U.S. Treasuries. The $3 billion 10-year tranche was priced to yield 105 bps over U.S. Treasuries, 12.5 bps less than what investors would demand to own similar-maturity Saudi government debt. Aramco received the strongest demand for its longest-dated, highest-yielding 30-year bonds, which are effectively a bet on Saudi Arabia and oil around the year 2050. Longer-dated bonds are usually popular with pension funds and insurance companies seeking to match the duration of their assets and liabilities. The final order book came in at $92 billion as the company dropped a planned floating-rate note and some requests were pared back. The bonds’ use of proceeds are to raise money to finance the Saudi kingdom’s economic agenda after an initial public offering of Aramco was postponed last year until at least 2021. Saudi Crown Prince Mohammed bin Salman, who runs the country day-to-day, is using the state oil producer’s pristine balance sheet to finance his ambitions for the country’s economy, in what many investors see as the country’s first major step onto the global financial stage. During its worldwide roadshows, Saudi Aramco’s potential investors were showered with financial data and operational secrets of the kingdom’s most important asset, information that had been held closely since the company’s nationalization in the late 1970s. With $111.1 billion of profit in 2018, low debt relative to its cash flow and access to one of the world’s largest hydrocarbon reserves, the disclosures gave investors many reasons to place orders, especially as Moody’s Investors Service likened the oil company to a AAA rated corporation. Investors also tend to be eager to subscribe to marquee first-time issuers as such trades allow fund managers to diversify their investment base, plus funds that tie their performance to indices need to hold a portion of Saudi Aramco’s bonds given its benchmark size. However, a concern raised by investors during the roadshow was around Riyadh’s control over Saudi Aramco. Saudi Arabia’s energy minister is also the chairman of Aramco, sparking questions about whether decisions at the company will be made for the benefit of the state rather than investors. The immense success of the bond sale was further reflected in its secondary market performance where the bond spreads have tightened since their debut, suggesting ongoing demand across various maturities.